Toradol is commonly prescribed after surgery. 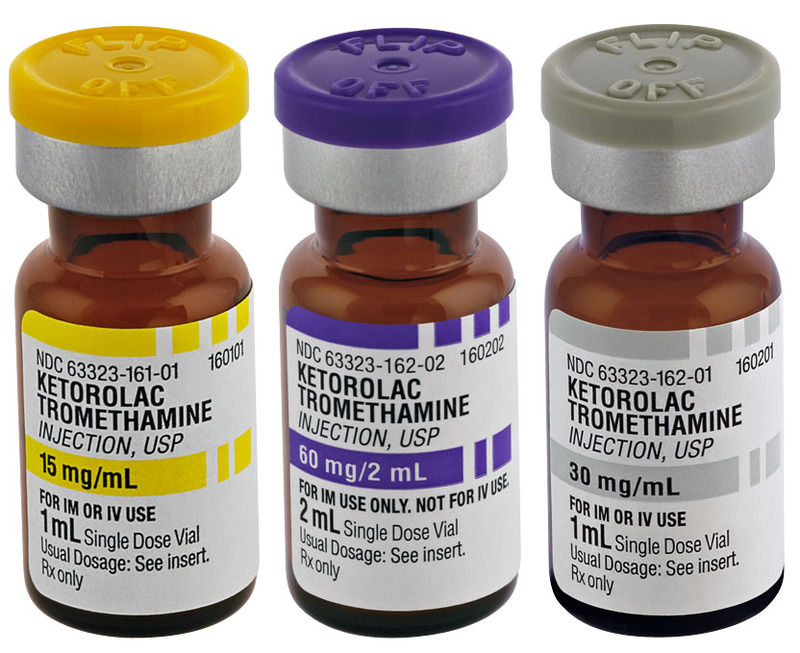 It is also sold under the generic name of Ketorolac. It helps reduce hormones in your body that cause inflammation and pain. It is available as an IV additive, injection, and as a tablet form. Tablets should only be used if you have already received the injectable form first. Toradol is not indicated for mild or ongoing pain. Toradol is used short-term (five days or less) due to the increased risk of serious side effects on your stomach and intestines. Serious life threatening gastrointestinal effects can occur while taking Toradol. Toradol can also increase your risk of life-threatening circulation and heart problems, such as stroke and heart attack. Risks increase with longer use of Toradol. Seek medical care immediately if you experience chest pain, weakness, slurred speech, shortness of breath, vision or balance problems, black or bloody stools, tarry stools, or if you are coughing up blood or vomit that appears to look like coffee grounds. You should not take Toradol if you are allergic to ketorolac, aspirin, or other NSAIDs. People should not take Toradol if they have severe kidney disease, a closed head injury, bleeding in the brain, bleeding or blood clot disorder, stomach ulcer, history of stomach or intestinal bleeding, or if you are breast-feeding an infant. This medication should not be used on anyone under the age of 18 years old. Toradol should be taken exactly as prescribed. Never take larger amounts of this medicine and never take it for longer than recommended by your physician. Toradol is generally given first as an injection. If you are given a prescription for the tablet form, take the tablet with a full glass of water. Toradol taken long-term can lead to damage of your kidneys and or cause bleeding. Common side effects of Toradol can include upset stomach, nausea, vomiting, diarrhea, constipation, bloating, gas, mild heartburn, stomach pain, sweating, dizziness, headache, drowsiness, and ringing in your ears. Seek emergency care immediately if your experience an allergic reaction such as hives, swelling of your face, lips, tongue, or throat, and or difficulty breathing. Contact your physician at once and stop taking Toradol if you experience chest pain, weakness, black, bloody, or tarry stools, swelling or rapid weight gain, shortness of breath, slurred speech, fever, sore throat, mouth sores, skin rash, neck stiffness, chills, increased sensitivity to light, purple spots on your skin, or seizures. Taking certain anti-depressant medications with Toradol can cause you to bruise and bleed easily. Inform your doctor if you are taking any blood thinners, lithium, alprazolam, thiothixene, methotrexate, diuretics, muscle relaxers, steroids, seizure medications, heart or blood pressure medicines, aspirin or other forms of NSAIDs, and ACE inhibitors. Other medications not listed may interact with this medicine. Always discuss all prescription, over-the-counter medications, supplements, and herbal medications with your physician. Serious drug interactions can occur.